A data-driven study of the complete Internet of Things (IoT) market. This is the full version of "The Internet of Things Market," by Aman Naimat. A downloadable version is available as well. The Internet of Things (IoT) is that brilliant kid who’s grown up but still stuck at home. Will 2017 be the year that IoT finally moves out and gets a job? This report presents the current market for IoT, including top companies and industries adopting IoT, based on a data-driven methodology. Unlike previous work from McKinsey and other analysts, this report presents an approach for measuring the market based on big data rather than models or human-entered surveys. While we cannot predict the future, we believe that the following is the most accurate snapshot of what IoT will look like in 2017. We found that over 2,000 companies have adopted IoT, and more than 200 companies have made it a strategic direction for their business. Today, spending on IoT is focused on simple use cases such as security, retail, and inventory, while more complex use cases like patient monitoring and traffic monitoring are still in their infancy. Adoption of IoT is steadily increasing and, compared to other trends like big data, is much more widespread in terms of geography, use cases, and industry. This report is a data-driven study of the complete IoT market. It is derived from live data triangulated across the entire business world— websites, meetups, hiring patterns, business relationships, blogs, press, forums, SEC filings… everything—using data crawlers and proprietary natural-language parsing technology developed by Demandbase. We processed almost 300 TB of text and billions of unique documents for this study. This bottom-up data methodology is in sharp contrast to traditional approaches that depend on anecdotal evidence derived from small samples of users and analyst surveys. The IoT has been the focus of many studies—most of which have been published since 2012—that present a future potential market for IoT. The earliest was GE’s Industrial Internet white paper (2012), which predicted $276 billion gains over 15 years from IoT applied across aviation, power, healthcare, and energy. Cisco’s Internet of Everything white paper (2013) predicted a $13 trillion consumer surplus generated from IoT by connecting people and devices. According to McKinsey’s detailed use case study (2015), the total impact of IoT will be $4–$11 trillion by 2025, with B2B driving 65% of that value. The McKinsey study also provides a detailed breakdown of verticals in which the value from IoT will be created. In the present study, we discuss the current adoption of the IoT market and its use cases. While this study measures the current state of IoT investment and activity, it is perspicacious to note that the total number of Google searches for “Internet of Things” surpassed searches for “Big Data” in early 2016. In fact, the gap continued to widen throughout the rest of the year. While we have no evidence of correlation between Google searches and dollars, it nevertheless fuels the idea that activity in the IoT space is growing to sizes that may one day surpass other technology trends. The following table illustrates the top factors behind the current growth of the IoT market. The total number of connected devices in the world is growing at 20%–30% year over year. Some of the largest brands and businesses are now backing and standardizing the IoT. 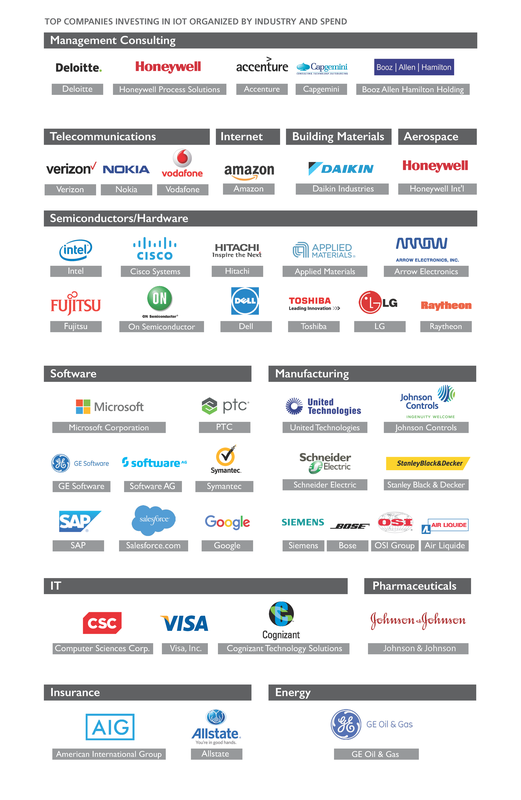 A large number of IoT platforms are available through major vendors. The number of workers skilled in development and implementation of IoT products and platforms has been growing. IoT only works if we can process, analyze, and react in real time. A number of vendors and open source platforms now provide necessary plumbing and database services to take action on IoT data. IoT is driving industrial automation in manufacturing and healthcare, both high revenue producing sectors. Cost of sensors has been halved over the last decade. 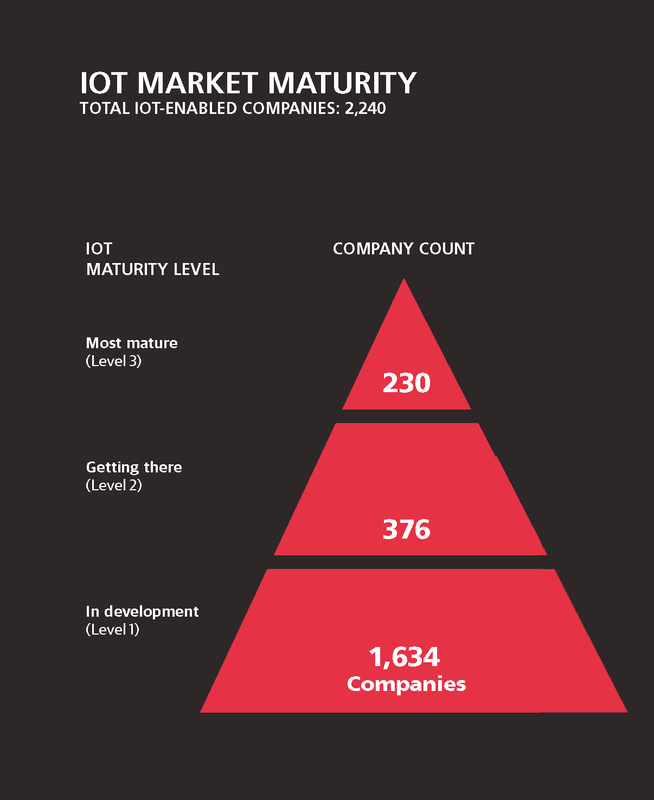 Overall, we found 2,240 companies who have adopted IoT at varying levels of maturity. There are 1,634 companies still in development with IoT projects (Level 1), 376 companies where IoT has been deployed either within a department or with a specific use case (Level 2), and 230 companies where IoT is a strategic direction and is deployed for multiple use cases. While these numbers may not seem large, they are surprisingly competitive; while the buzz around big data is louder, the actual adoption of big data in industry isn’t much larger than the adoption of IoT. 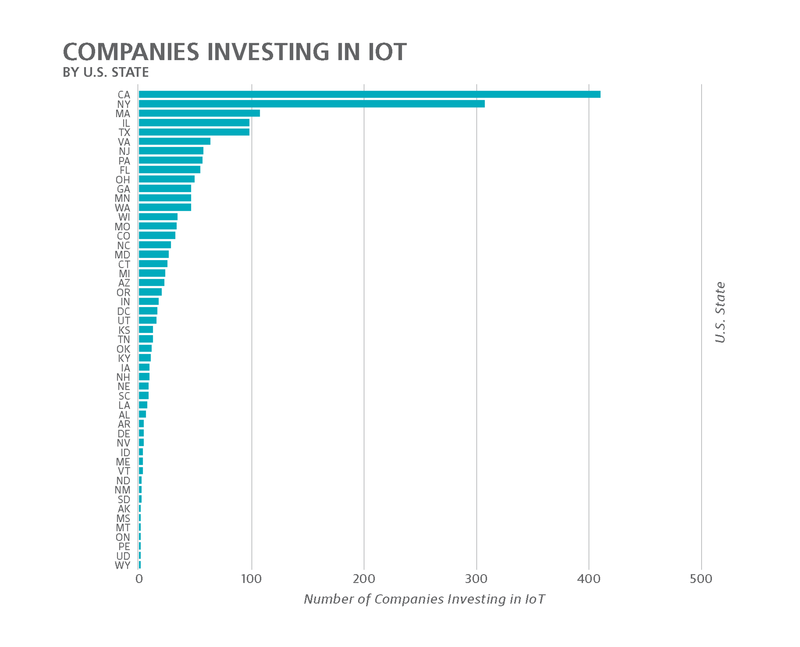 The following are the top companies ranked by spend and adoption of IoT across all industries. 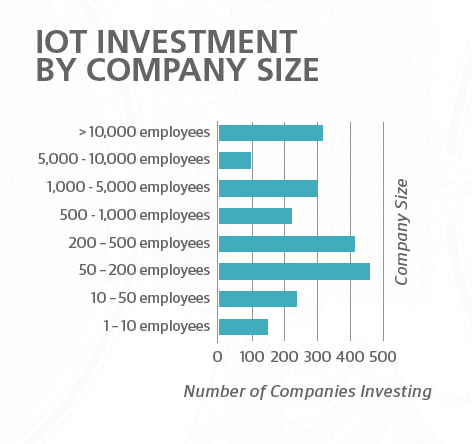 The measurement is normalized per capita; thus, these companies have the most investment in IoT per employee. The list excludes vendors who exclusively sell IoT platforms. 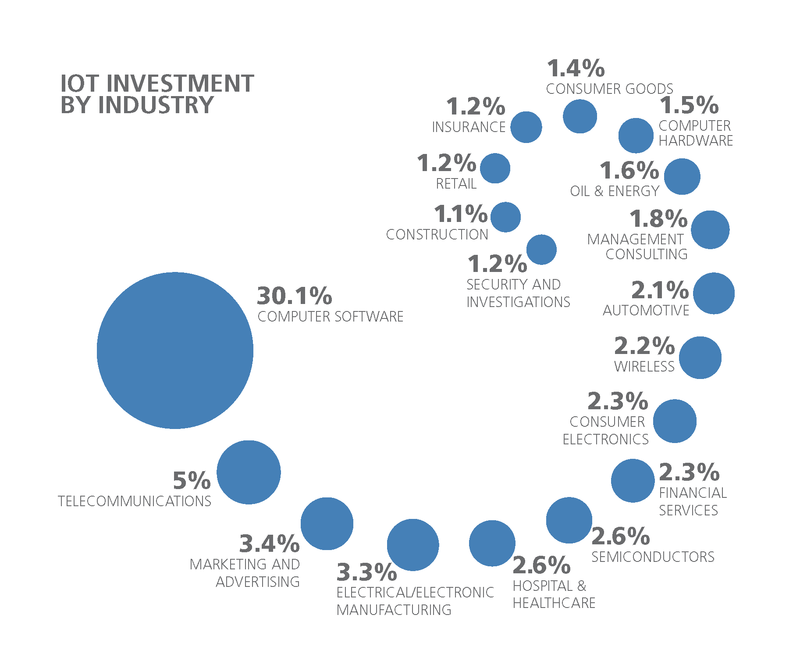 When classifying the industry of each of the 2,240 companies adopting and investing in IoT, as expected, software companies and telcos lead the sector, followed by retail and manufacturing. More revealing than industry classification, which tends to be generic, are the use cases for IoT and details about how companies are spending their budgets on IoT projects. 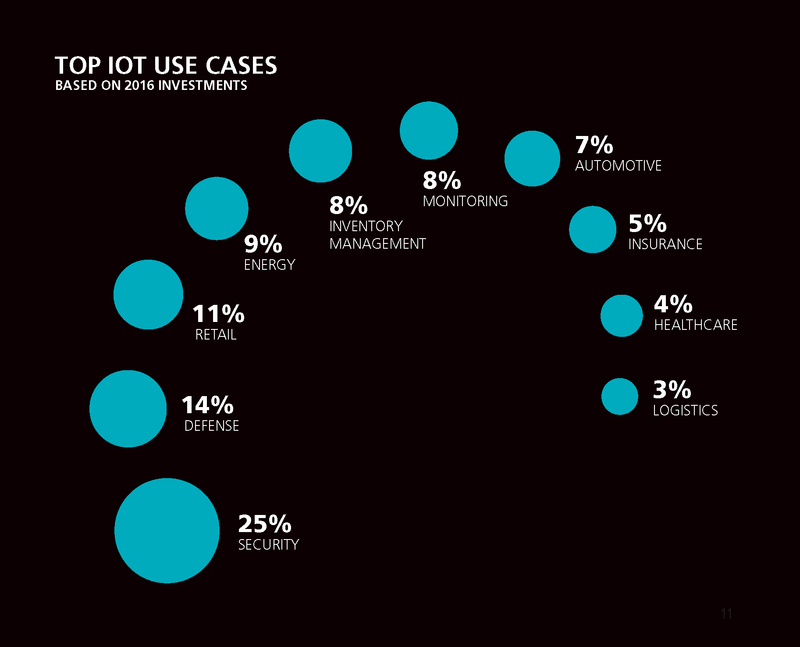 The spend shown in the next figure on IoT use cases is based on actual 2016 investments. It is approximated by looking at companies using IoT to enable their business processes, build complex products, conduct deals with IoT vendors, and hire people with IoT skills. We found that IoT spending today is for use cases that are much different than those predicted by McKinsey, Gartner, and others. For example, the greatest value/consumer surplus predicted by McKinsey was in factories around predictive maintenance and inventory management, followed by healthcare and smart city–related use cases like public safety and monitoring. While these use cases may be the top producers of surplus in 2025, we do not see much spend on those use cases today. In contrast, home energy and security is low on the McKinsey list, but that’s where the market is today, in addition to defense and retail. One potential reason for this disconnect is that manufacturing and healthcare use cases are currently complex, risky, and difficult to implement. Furthermore, these industries are regulated, and both culture and public policy have yet to catch up with the technology. We see the same phenomenon in autonomous cars. The future use cases predicted by McKinsey and Gartner involve cars being rerouted by adaptive traffic controls, but we’re not seeing that yet. Another example of a use case that hasn’t taken off yet is online patient monitoring, which seems one hundred times more complex than simple home monitoring or personalized displays for in-store customers. IoT spending today is for use cases that are much different than those predicted by McKinsey, Gartner, and others. Unlike our previous study on The Big Data Market (O’Reilly), where we saw that larger enterprises were spending more on big data technologies than were smaller companies, IoT adoption by company size is not asymmetric; there is a more continuous adoption of IoT across large and small companies. The location of companies spending on IoT is also distributed more evenly across the United States than the adoption of big data, which is highly concentrated on the coasts. This corroborates with the fact that use cases for IoT such as security, retail, logistics, healthcare, and energy are also distributed. The other surprise in the list of companies adopting IoT is how different they are from companies adopting big data. One would imagine a strong correlation between companies adopting big data and those adopting IoT. Factors like innovation or early adoption culture generally drive companies to try new technologies, no matter what they are. That hasn’t been the case for IoT. In fact, companies adopting IoT are completely different than those adopting big data technologies, even though the industry classification may look similar. We found only 380 companies investing in both big data and IoT, including Nokia, Samsung, and Johnson Controls. From the data in this report, we believe that IoT is finally ready for real action in 2017. In 2016, we found that major industries are adopting IoT faster than big data. Of the 2,240 companies with IoT-driven projects, over 230 are adopting IoT as a strategic direction for their company. Use cases for IoT are still in their infancy and complex use cases like healthcare monitoring, adaptive traffic control, and public safety aren’t as widespread as predicted by market analysts. However, the availability of talent, platforms, and real-time data processing are enabling a multitude of IoT use cases that were not available until recent years. Unlike big data, IoT is gaining traction in both large and small companies, and requires less investment to be a player in the space. The uniform adoption of IoT across industries and geographies signals that IoT has finally crossed the chasm, and its potential to transform our landscape is growing more rapidly everyday. Article image: Geometrical abstract (source: O'Reilly).